Samsung is no stranger to releasing updates to an existing version of Android after a newer version has debuted, at least when it comes to budget smartphones and tablets. And that may also be the case with the Oreo update for some Galaxy A, Galaxy J, and Galaxy C series of phones. 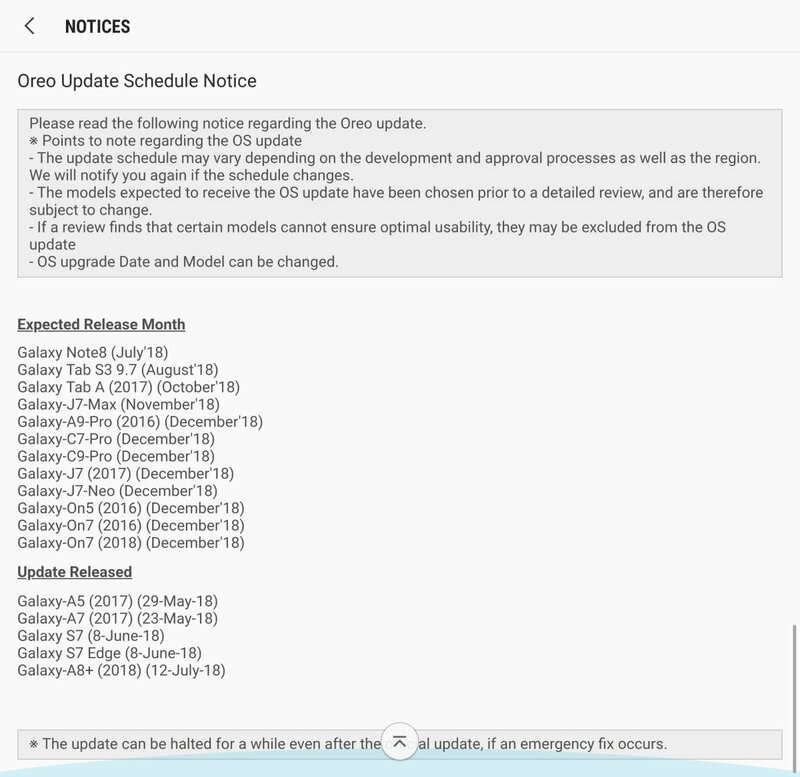 Samsung has a notice posted in the Samsung Members app with a schedule for the Oreo update, and while these notices can differ by country, it does give us a good idea of how long some Galaxy owners may be waiting for Oreo. This particular notice can be seen by Indian users. As you can see in the screenshot below, quite a few devices are in for a wait till December. The list includes budget phones and some mid-range devices that had a limited release, like the Galaxy J7 (2017), Galaxy A9 Pro, Galaxy C7 Pro, and the 2016 and 2018 variants of the Galaxy On7. The Galaxy Tab A (2017) is slated to receive Oreo in October, while the Galaxy J7 Max (another not-so-widely available phone) will get it in November. As Samsung notes, the update schedule can change based on “development and approval processes.” But if that doesn’t happen, then Oreo will take much longer to arrive for some devices compared to the time it took their predecessors to receive the Nougat update. For example, the Galaxy J7 (2016) was updated to Nougat in India in early September. That’s a difference of three months, which is a lot any way you look at it. Oreo has been a problematic update for Galaxy devices in general. Many devices had to have their Oreo update halted as it introduced device-breaking bugs, and maybe that’s why the company is taking longer this year with a major OS upgrade. Or it’s in over its head with too many devices to update and may also be taking it slow for devices that have had limited sales. In any case, if you own any of the phones or tablets mentioned in the notice, well, patience is the virtue. To check whether there’s a similar notice in your country, open the Samsung Members app, bring up the hamburger menu by swiping in from the left edge of the display, then tap Notices. Do let us know if you see a different schedule by leaving a comment. Also check out if your current Galaxy device is slated for an Android 9.0 P update. Weird thing is.. on Samsung Members Brazil, only the A9 Pro (A910), J7 Neo and On7 2018 are on the list. Not the Galaxy S7 and A7 2017! Interesting the A9 Pro to be related in Brazil, since there has not received any new patch since when it received Android 7.0 Nougat in August 2017. What about samsung galaxy c9pro (C900f)..?? For this model got wifi certificate in last week na then does it get delay to release..?? Yeah, one hope that this schedule isn’t too final. December is a long time to wait. It does annoy me that they have dropped support for the A3 2017 edition, if the A5 and A7 get Oreo – so should the A3! Releasing too many models is their problem and their choice, not something a customer should know or care about. People have the right to complaint about it, first of all Samsung’s devices are more expensive than most android devices( even their midrange ones). Secondly it’s their fault if they release many models each not ours. It is unfair to leave people waiting for too long! Darn you auto correct! I didn’t mean Oregon or Orellana, I mean OREO!